The monthly Sea Ice Index provides a quick look at Arctic-wide changes in sea ice. It is a source for consistently processed ice extent and concentration images and data values since 1979. 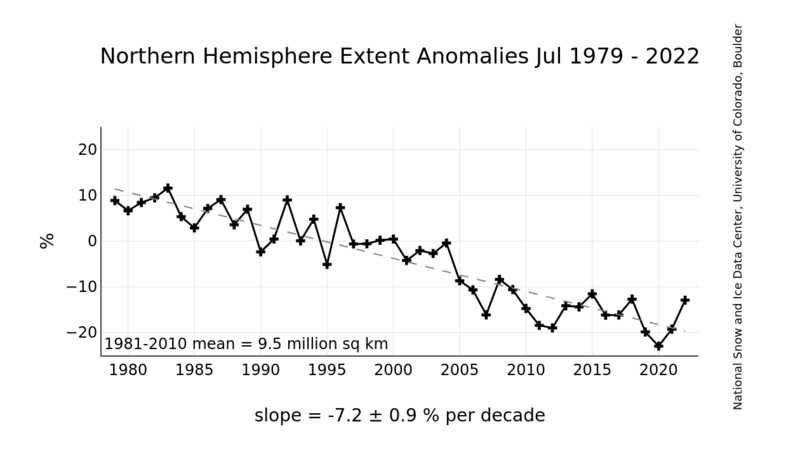 Monthly images show sea ice extent with an outline of the 30-year (1981-2010) median extent for that month (magenta line). 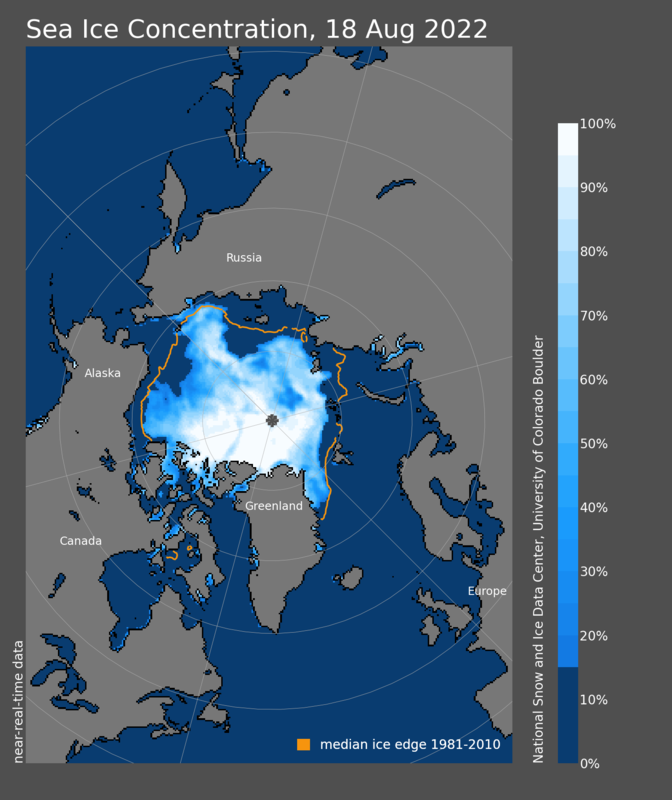 Other monthly images show sea ice concentration and anomalies and trends in concentration. 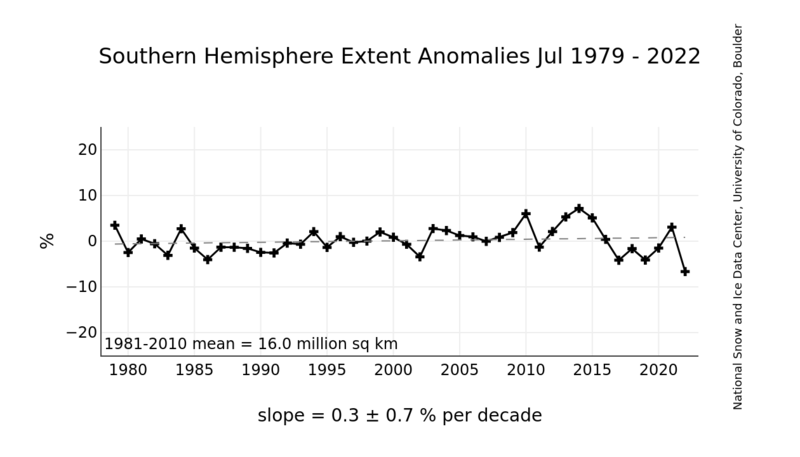 The monthly extent images show the expanse covered by ice at greater than 15 percent monthly mean concentration for the Arctic and Antarctic. The total extent value is given in the bottom margin. It is derived from passive microwave data. The median line (in pink) shows a typical ice extent for that month, based on data from 1981 through 2010. 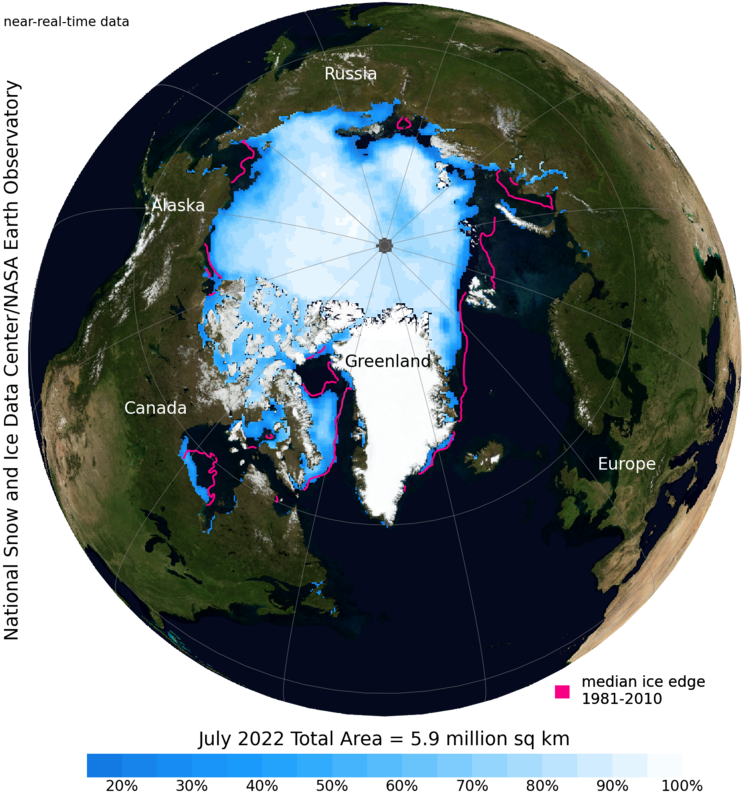 The area around the North Pole that the satellite does not image is assumed to be covered by ice at more than 15 percent concentration. 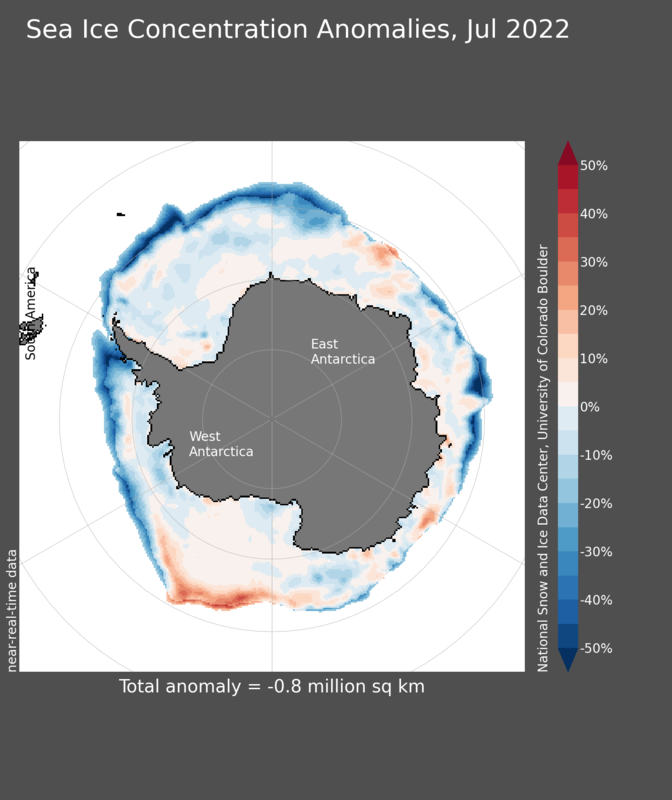 The monthly concentration images show a particular month's ice concentration with each 25 km data cell color-coded in shades of blue to white, where dark blue is zero percent ice (ocean) and white is 100 percent ice. The area around the North Pole that is not imaged by the satellite is left out of the images (dark grey circle). These images of anomalies in ice concentration show, in percent color-coded in shades of blue (negative anomaly) to red (positive anomaly), how much the ice concentration for a month differs from the mean calculated for that month over the 1981 through 2010 time range. 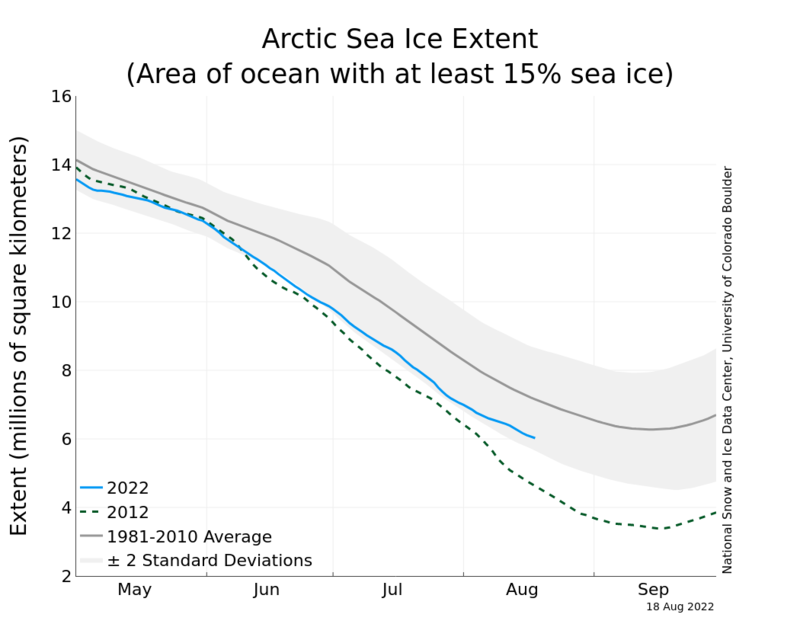 The total anomalous area of sea ice for that month is also shown in the bottom margin of the image. 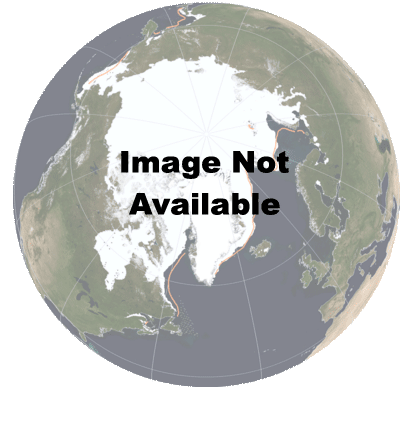 The area around the North Pole that is not imaged by the satellite is left out of the images (white circle). 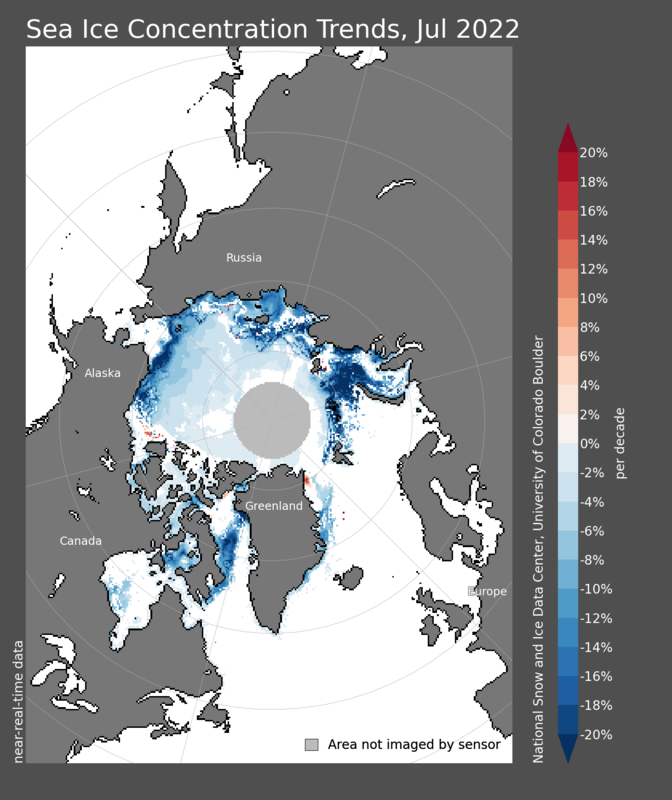 These images of trends in sea ice concentration show if the trend in sea ice concentration at a particular grid cell location is positive or negative and give some indication of its magnitude in percent change per decade color-coded in shades of blue (negative trend) to red (positive trend). The area around the North Pole that is not imaged by the satellite is left out of the images (white circle). 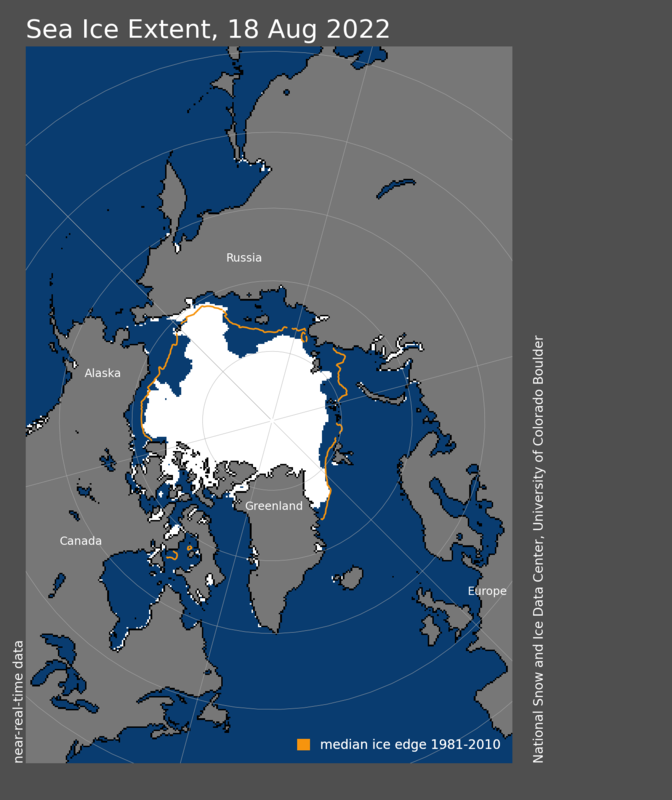 The daily Sea Ice Index provides a quick look at Arctic-wide changes in sea ice. It provides consistently processed daily ice extent and concentration images and data since 1979. 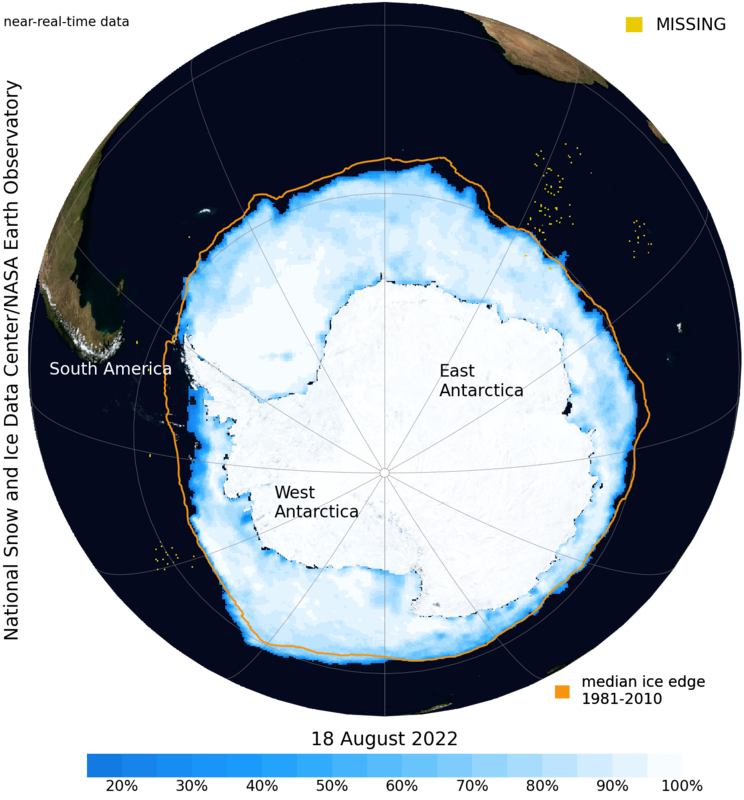 Daily extent images show ice extent at concentrations greater than 15% for a given day with an outline of the typical extent for that day based on a 30-year (1981-2010) median (orange line). 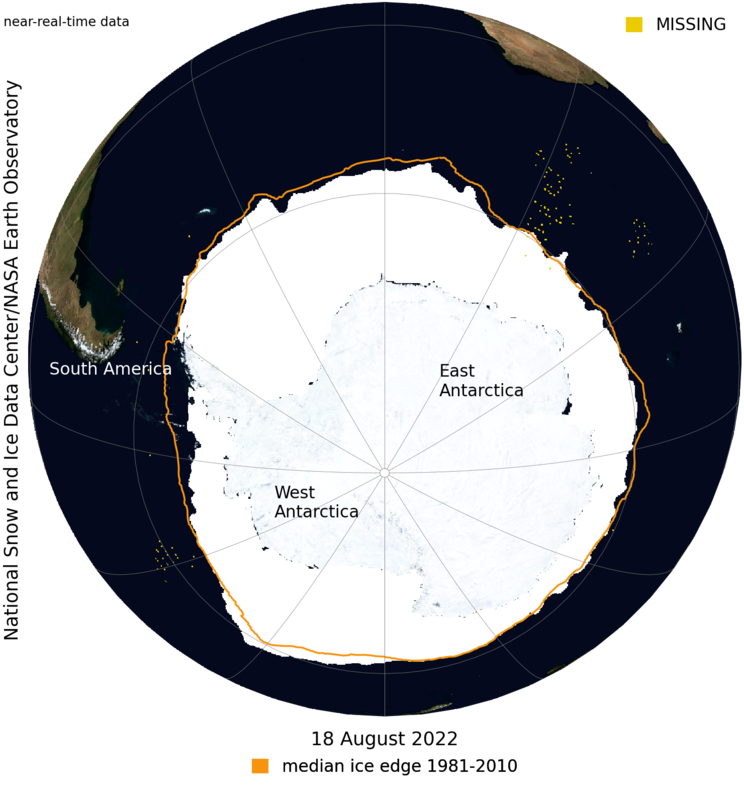 These images show the extent of ocean covered by ice at any concentration greater than 15 percent for a given day. This snapshot of current ice conditions may be missing data (missing data appears as gray dots or areas). The median line (orange in images) shows a typical ice extent for that day based on data from 1981 through 2010. 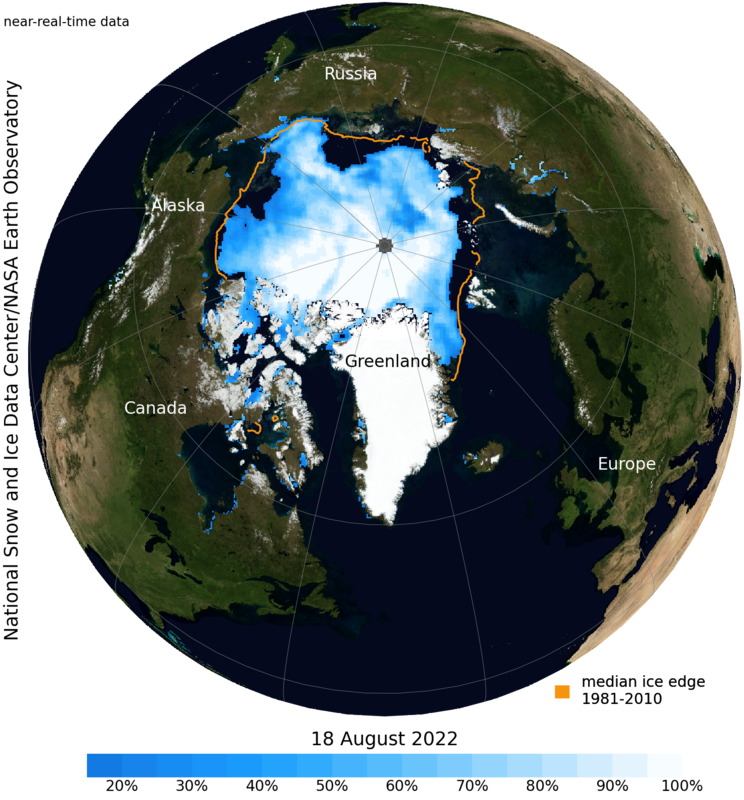 The area around the North Pole that the satellite does not image is assumed to be covered by ice at more than 15 percent concentration. 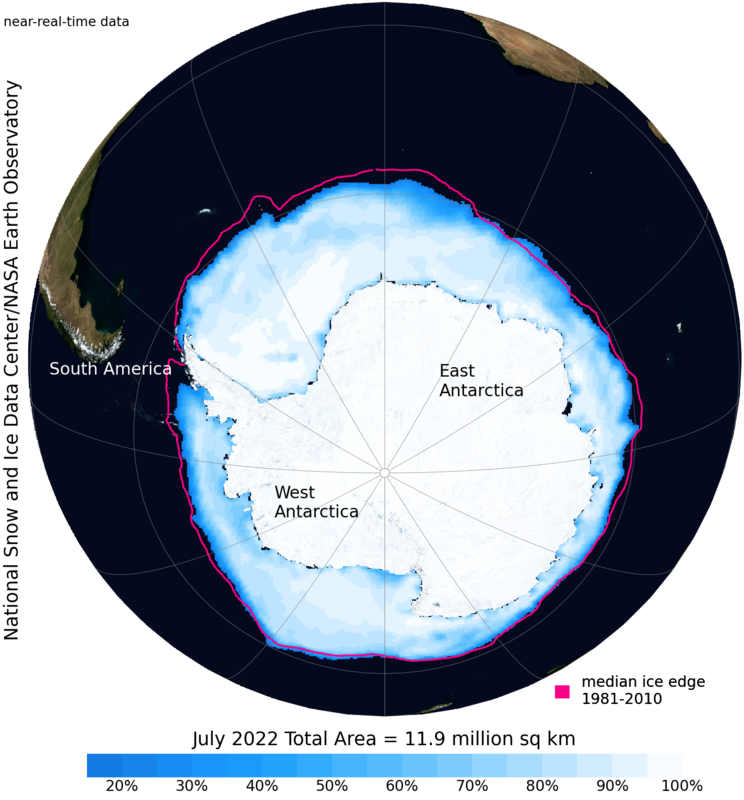 These images show the percentage of ice cover for each roughly 25-kilometer-square data cell that is more than 15 percent covered by ice on a given day. The daily images may be missing data (missing data appears as dark grey dots or areas). The area around the North Pole that is not imaged by the satellite is excluded from the area because there is no way to know what the concentration is within this area. 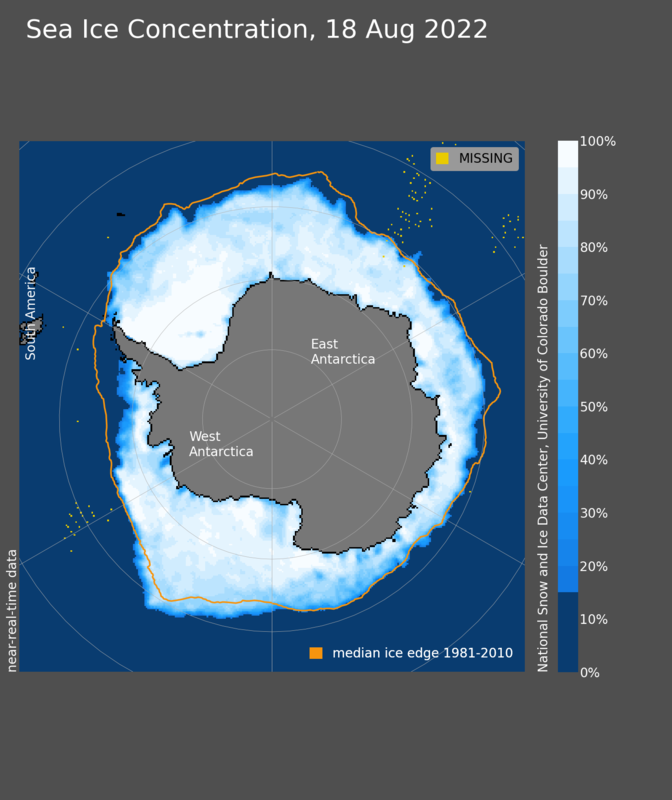 The monthly Sea Ice Index provides a quick look at Antarctic-wide changes in sea ice. It is a source for consistently processed ice extent and concentration images and data values since 1979. 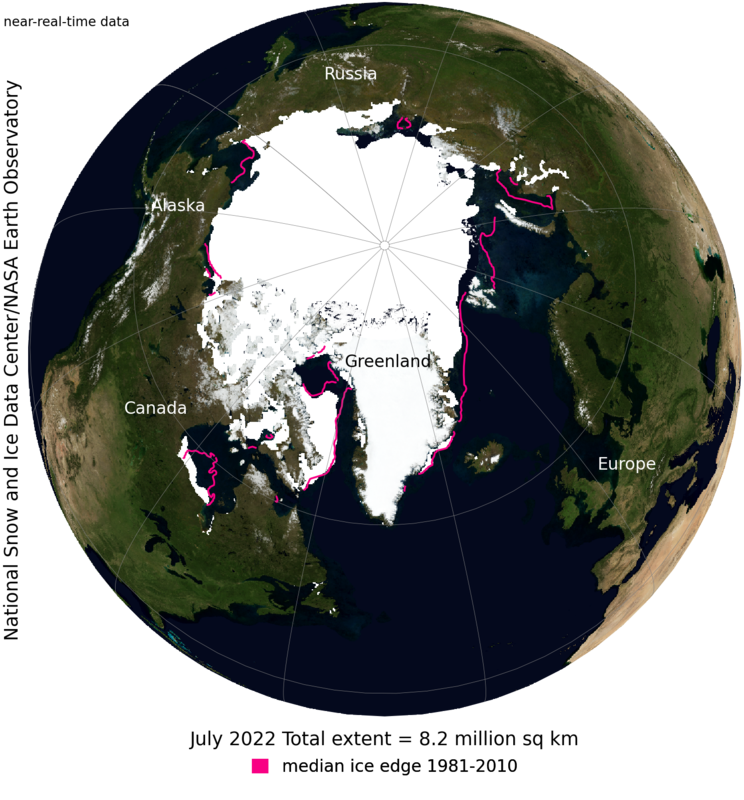 Monthly images show sea ice extent with an outline of the 30-year (1981-2010) median extent for that month (magenta line). 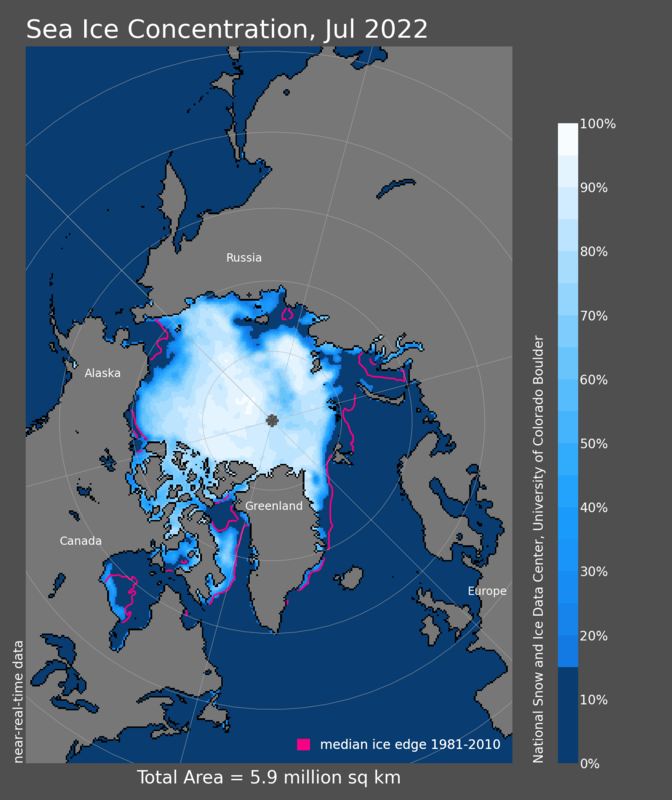 Other monthly images show sea ice concentration and anomalies and trends in concentration. 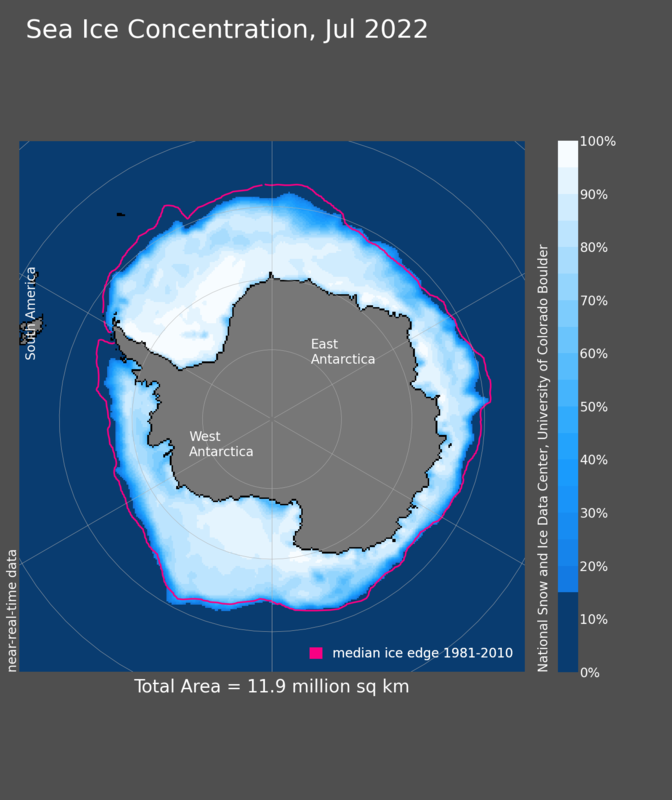 The monthly extent images show the expanse covered by ice at greater than 15 percent monthly mean concentration for the antarctic and Antantarctic. The total extent value is given in the bottom margin. It is derived from passive microwave data. 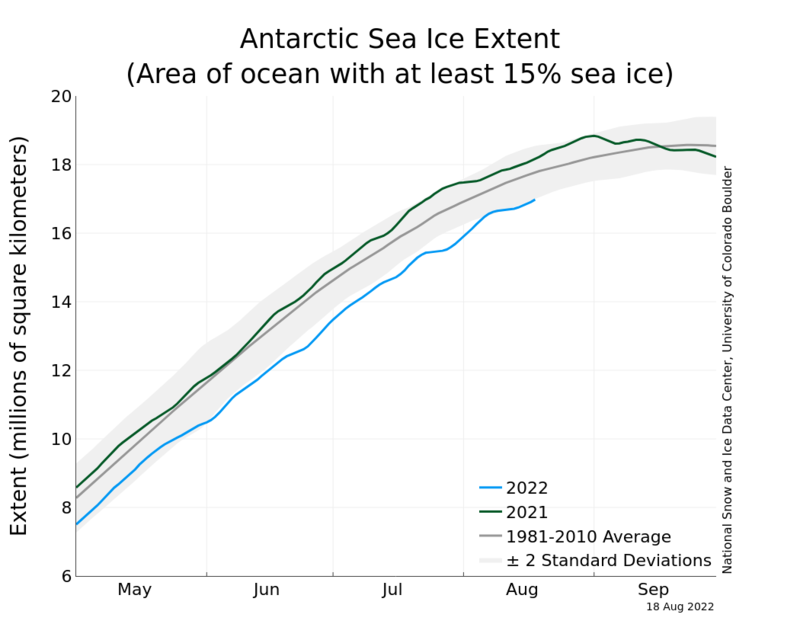 The median line (in pink) shows a typical ice extent for that month, based on data from 1981 through 2010. 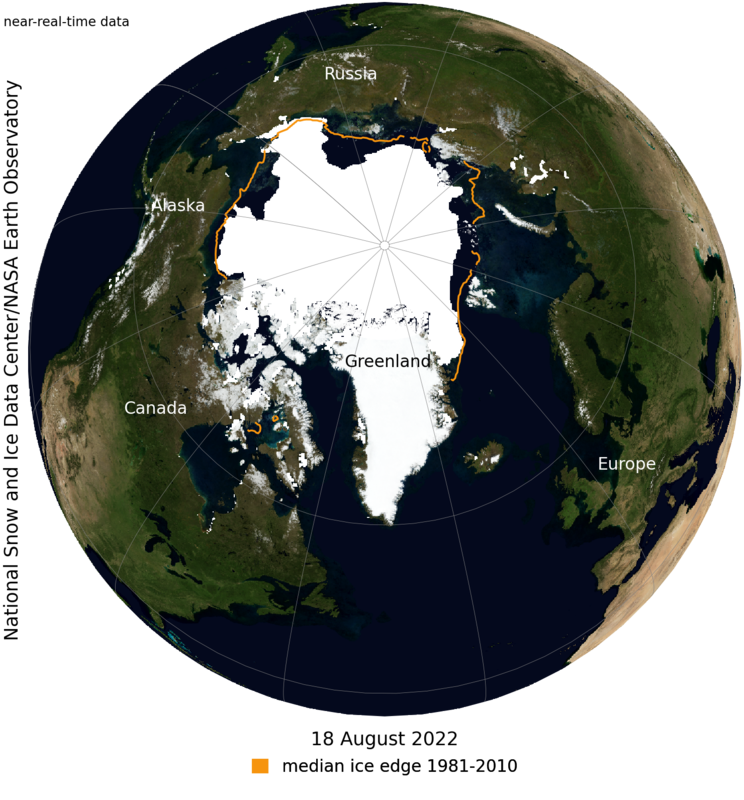 The area around the North Pole that the satellite does not image is assumed to be covered by ice at more than 15 percent concentration. 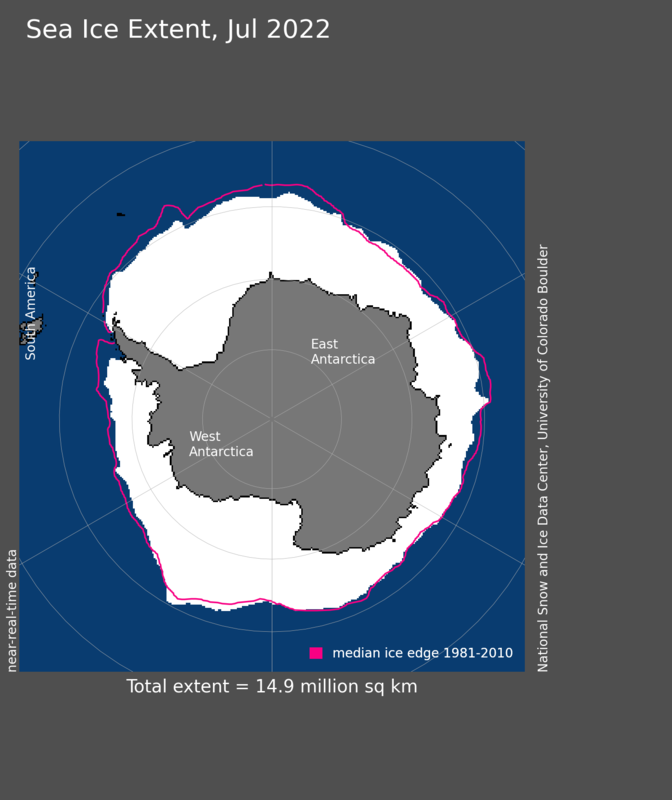 The daily Sea Ice Index provides a quick look at Antarctic-wide changes in sea ice. It provides consistently processed daily ice extent and concentration images and data since 1979. 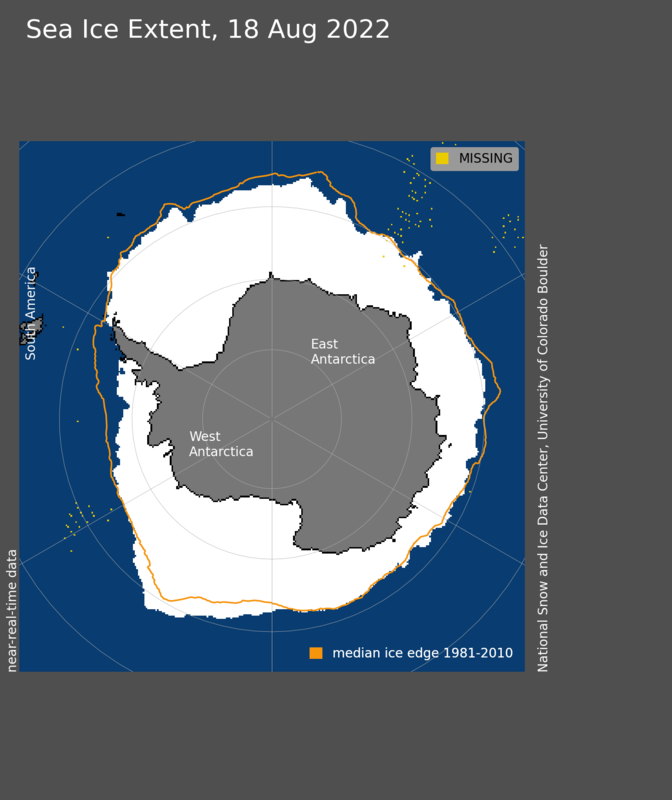 Daily extent images show ice extent at concentrations greater than 15% for a given day with an outline of the typical extent for that day based on a 30-year (1981-2010) median (orange line).